according to simple and innovative concepts. parts wear and maintenance time. easily the eventual machine stop causes. Upper vibrators that can be dismantled. controlled and regulated by fiber optic sensors. Flat surface for manually splicing film reels. 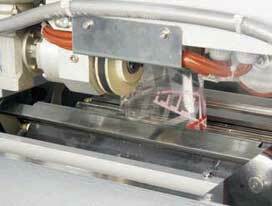 Rotating metal plate vertical sealer. connected directly to PC in serial mode. 0,5 -1 gr. /1 -2 gr. 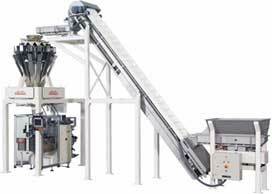 (*) Weight accuracy always depends on speed and product specific weight. (**) Dimension max. sachet: 140x180H mm. 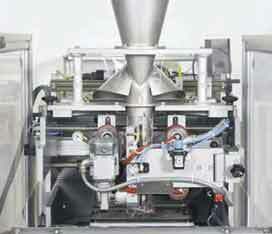 Speed refers to 50 gr of a free-flowing product with a density of 60-70 gr/litre. Bag max. sizes: 140x180H mm. 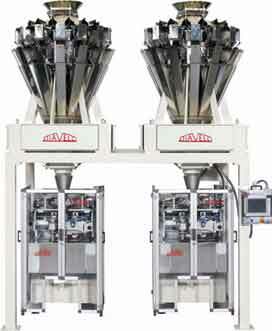 SVMC - SNACK High Speed VFFS Vertical Form Fill Seal Machines with integrated Multihead Combination Weighers. 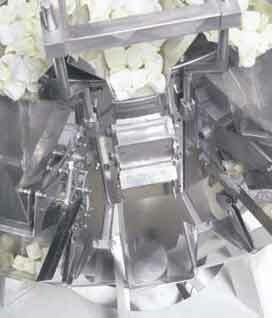 SVMC Stiavelli VFFS forming collar.